In the late 1880s, the pieces came together to create a new type of ship that would dominate the seas for most of the next two decades. 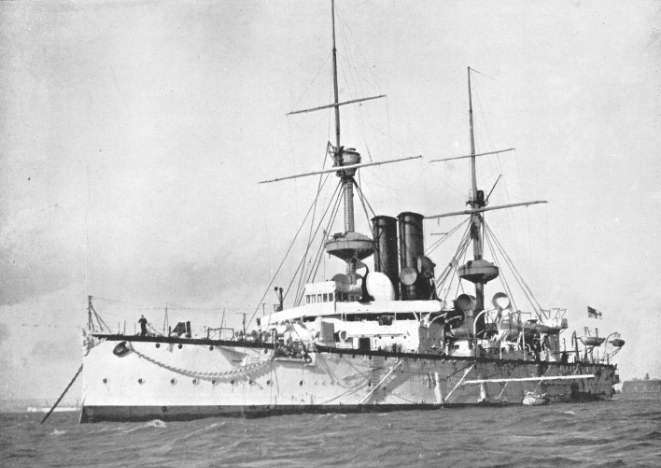 After 1906, these became known as pre-dreadnoughts. While all of the elements that made them up had been used on previous ships, the end result was to bring an end to the experimental ships and produce the largest fleets of armored capital ships ever seen. But what sort of ships were to be built under the Act? 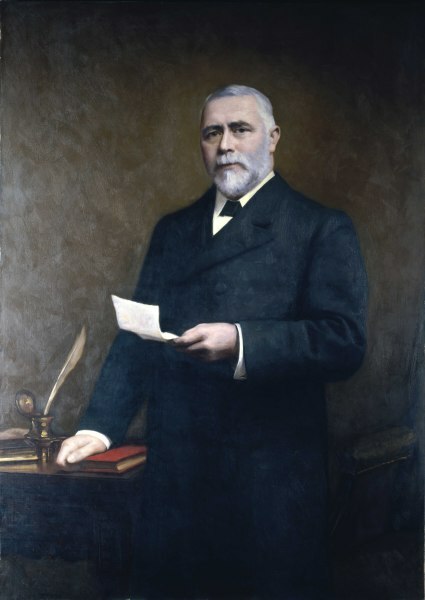 The First Sea Lord, Admiral Arthur Hood, was a proponent of low-freeboard turret ships, while the Director of Naval Construction, William White, was an advocate of the high-freeboard barbette ship. Eventually, the decision was made mostly in White's favor, as the seven ships of the Royal Sovereign class were high-freeboard ships with open-topped mountings, while one ship, HMS Hood was designed on very similar lines as a low-freeboard turret ship. The Royal Sovereigns were excellent ships. First and foremost, this was because they were significantly bigger than their predecessors, at around 14,000 tons instead of the 10,000 or so that had been the standard since Warrior. A bigger ship makes the designer's job easier, and White could avoid many of the compromises that had plagued older ships. Second, the freeboard was now 18', as opposed to 10' in the proceeding Trafalgars. This made it possible for the Royal Sovereigns to maintain speed and fight their guns effectively in the typical seas found in the Atlantic. 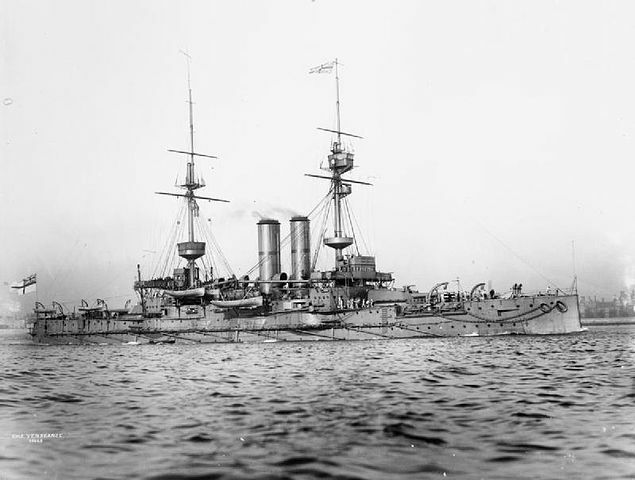 The main armament was two pairs of 13.5" guns in open barbette mounts. They carried 10 6" QF guns in casemates on the sides of the ship, the first vessels to be so armed, and five above-water and two submerged 18" torpedo tubes were fitted. For defense against torpedo boats, 16 6pdr and 8 3pdr guns were carried. An 18" lower belt and a 4" upper belt, the first use of pure steel armor on a British ship, provided protection, and their 18 kt speed set a new benchmark for battleships. 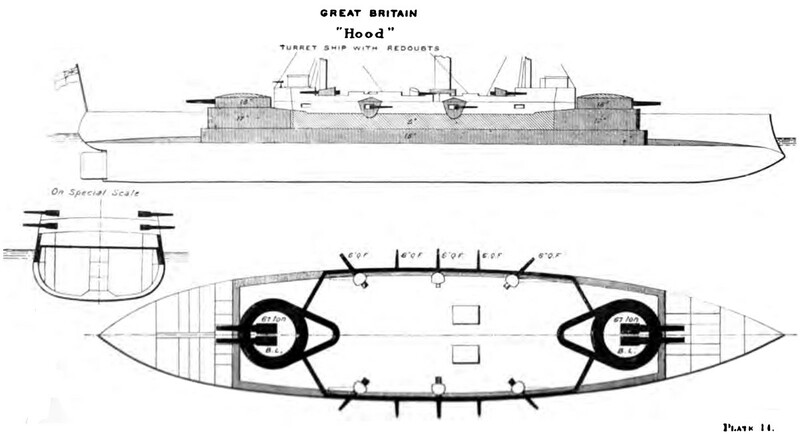 Hood was a result of a compromise with the faction that still advocated for low-freeboard turret ships.2 She was essentially a Royal Sovereign with the top deck fore and aft cut away, and the top level of the barbette turned into a turret. She was not a particular success, as her 11' freeboard made her very wet. Besides the advances in size and freeboard, the Royal Sovereigns marked a major organizational shift in the Admiralty. Previously, year-to-year funding of naval construction had stretched out completion of earlier battleships for 7 or more years, while the Naval Defense Act allowed all eight ships to be completed within 5 years of being laid down, a rate of construction that following ships matched or beat. Likewise, they were the first vessels to have a "Board Margin" of several percent of displacement built into the design, to avoid the problem of overweight that plagued the ironclads. 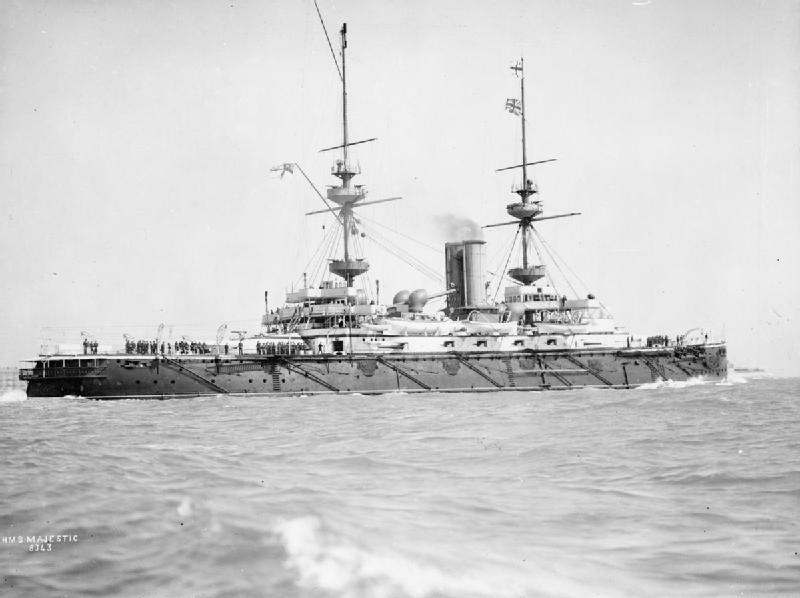 In 1892, with production of the Royal Sovereigns winding down, it was planned start work on three new battleships. Unfortunately, the planned 12" gun was not ready, and instead a modified version of Centurion was built. She was named Renown, and would later go on to greatly influence Jackie Fisher's thoughts on ships. She was the first British battleship with all-steel armor, and with fully protected high turrets. 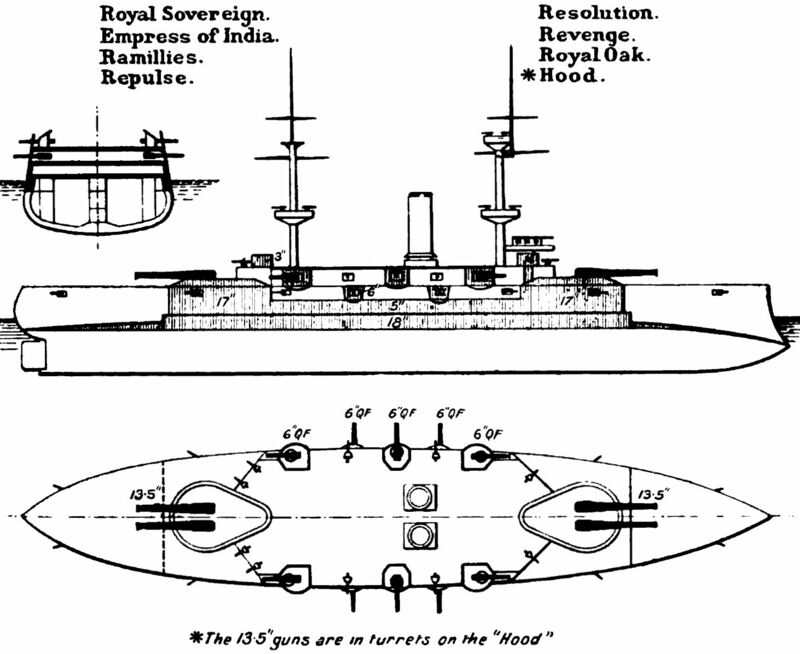 By 1893, the issues with the 12" gun had been sorted out and the definitive pre-dreadnought was laid down. 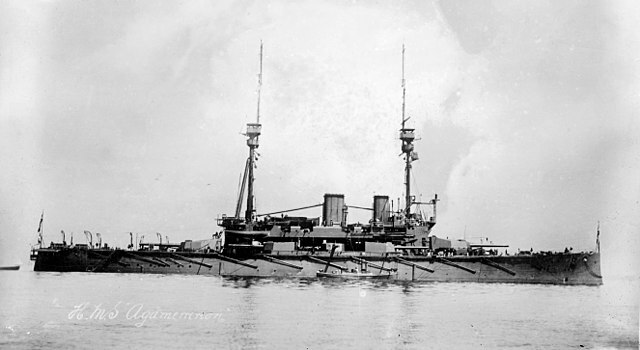 HMS Majestic and her eight sisters formed the largest class of battleships ever built. They were superb ships, and set the pattern for the pre-dreadnought both in Britain and abroad. White introduced a new armor scheme, where the edges of the deck were sloped down to meet the bottom edges of the belt, instead of the deck lying atop the belt, as on the Royal Sovereigns. This allowed the protection of the deck, 3" on the flat and 4" on the slopes, to be added to the belt, which was reduced to 9", but covered much more of the ship's side than it had on any previous battleship to protect against the recent threat of QF guns.5 Harvey armor was used extensively. Their 12" guns used smokeless cordite to throw projectiles at 720 m/s, as opposed to the 615 m/s muzzle velocity of the 13.5" guns of the Royal Sovereigns. They used turrets similar to those on Renown, which were effective against machine gun and QF fire, if a bit lightly armored relative to foreign designs.6 Later units of the class had improved mountings allowing all-around loading and higher rates of fire. The weight savings from the smaller-caliber main guns allowed an extra pair of 6" QFs, bringing the total aboard to 12, all of them in casemates. The Sino-Japanese War upset British defense planning, and led to the next development in British battleships. The Japanese were investing a great deal of the war indemnity in their fleet, and the British felt the need to produce a class of ships for the Far East to counter them. The resulting Canopus class had a draft limited by the need to transit the Suez Canal and operate on Chinese rivers. They were fitted with Krupp belts only 6" thick, a value not seen since the late 1860s. In many ways, these ships were descendants of Centurion and Renown, although they were the size of first-class battleships and had the same armament. 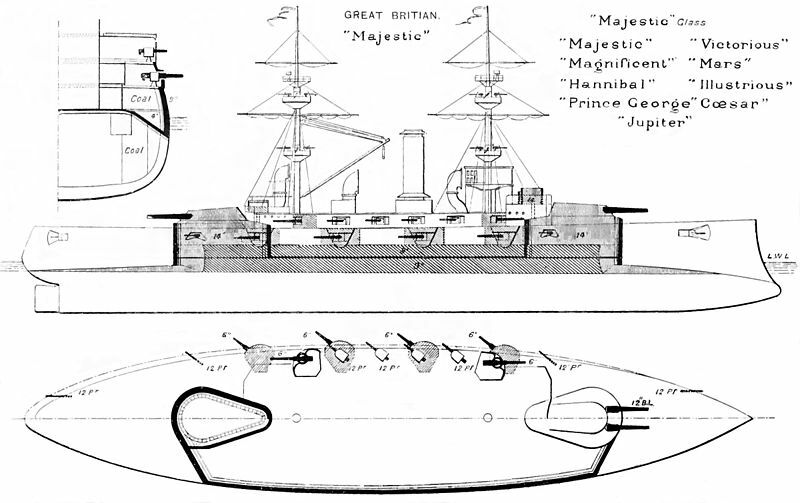 The next two classes are often described as improved Majestics, although they are more accurately thought of as enlarged and more heavily armored versions of Canopus. The Formidable class of 1897 had a 9" Krupp belt, and an improved 12"/40 gun.7 The next year, a few tweaks to the belt armor resulted in the London subclass. In 1898, large additions to the French and Russian building programs lead to an additional four ships being ordered. The Duncan class was designed for 19 kts, one more than had been standard since the Royal Sovereigns. They were slightly smaller than the Formidables and sacrificed a little bit of armor for their speed. 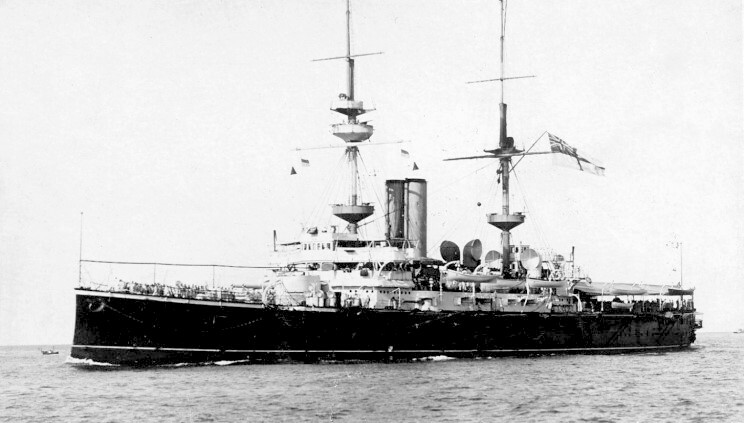 The following Lord Nelson class, ordered in 1904, became known as semi-dreadnoughts. They ditched the 6" battery completely, and were armed with 4 12" and 10 9.2" in four twin and two single turrets on the sides of the ship, with 45-caliber guns replacing the 40s of both types.10 The abolition of the 6" battery, and the belts needed to protect it, meant that great improvements in armor protection could be made, the belt returning to 12" with an 8" upper belt. 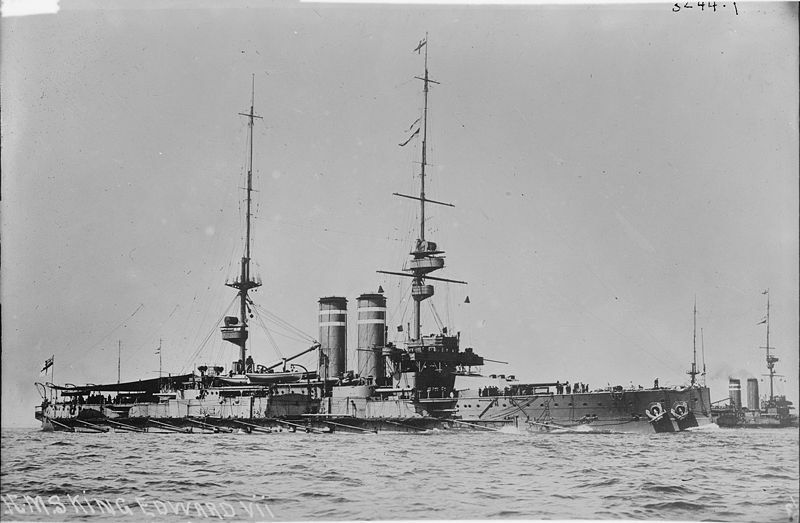 They were ultimately significantly better ships than the King Edwards, and were considered as part of the British battle fleet until just before WWI. 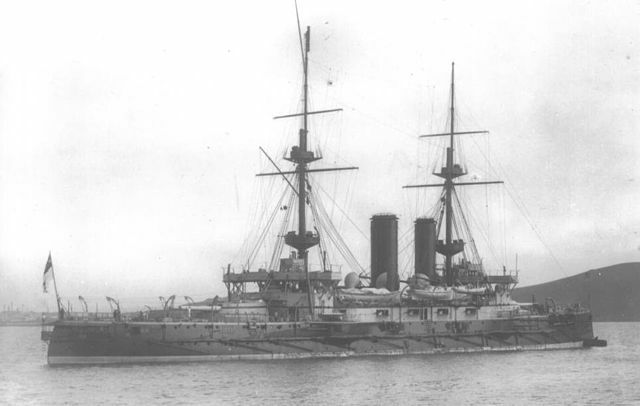 Unfortunately, they were completely overshadowed by HMS Dreadnought, who was laid down only 5 months later. One major reason was that their 12" gun mountings were diverted to hurry Dreadnought's completion, and they had to wait for replacement units to be built. Despite being at least partially obsolete on completion, and the fire control problems inherent in mixed main armament, they were good ships, and gave excellent service in the Mediterranean during WWI. Next time, we'll look at the ship that so influenced the battleship that all other ships are defined by relationship to her. Dreadnought. 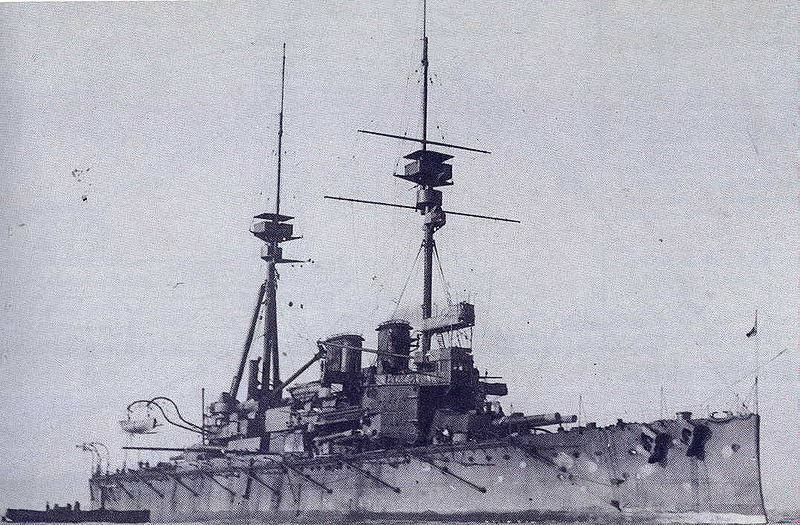 Reading through the pre-dreadnought article, I was struck by how many ships the British were building. Compare this to modern times where very few ships are being built. I'd be interested to read about what has changed that makes the pace of construction of ships so different. Is it possible that I'm thinking of the wrong countries and we should be looking at the pace of construction of Chinese ships? Ships went from being cheap and mostly costly due to steel to being expensive and mostly costly due to electronics. 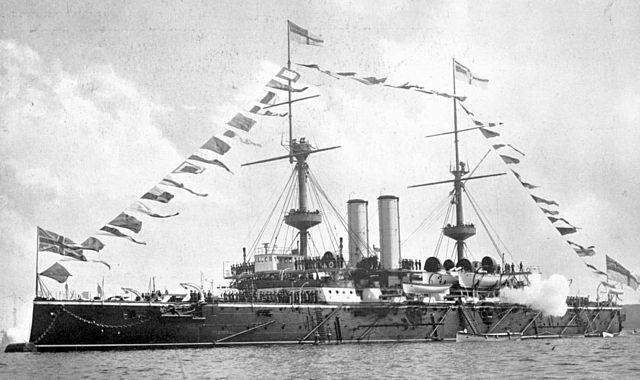 I just checked, and the British battleships built 1889-1896 cost a total of ~£2 billion in modern terms. Not each year, but across all years. Is that for all the ships or just for one ship? I checked the Arleigh Burkes and they’re about $2 billion per ship. Are they bigger than average? All ships. It was £16.8 million (then year) on battleships during that entire program, covering either 20 or 26 ships, depending on how where the Canopus class falls. So yes, a Burke costs as much as a dozen pre-dreads, give or take. Could a Burke take out a dozen pre-dreads? I guess that part of the price inflation could be due to Scott's cost disease? It would be interesting to see how much of it is because of expensive materials and how much of it is due to military contractors padding their pockets. Is that even a problem? If you ran current Burke vs the pre dreads, I’m not sure exactly what would happen. If the Burke was a little more optimized for surface combat, it would win easily. Cost disease is some of it. More is the increasing complexity of new systems. Contractor padding has probably gone down. I’ve got a post on this coming up in a few weeks.